In taxis and restaurants, doctor’s offices and the mayor’s office, nearly everyone in Miami seems to have a relative who graduated from Miami Dade College — or they did so themselves. 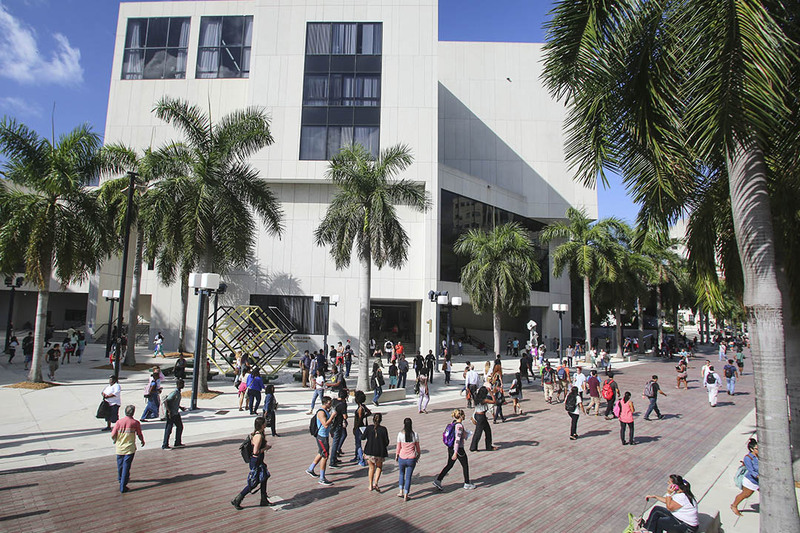 As the nation’s largest community college, with more than 95,000 students enrolled annually, Miami Dade’s presence is felt throughout the city. Miami Dade, along with Indian River State College, won the 2019 Aspen Prize for Community College Excellence, the nation’s signature recognition of high achievement and performance among America’s community colleges. The $1 million Aspen Prize, awarded every two years since 2011, recognizes outstanding institutions selected from an original pool of more than 1,000 community colleges nationwide. Miami Dade provides a clear path to economic and social mobility for its students. One year out of college, graduates earn more than $40,000, on average: 23 percent higher than what new hires in the region earn. Alumni include some of the most influential business and nonprofit leaders in the region and internationally — including former presidents of Panama and Haiti. The college is geographically dispersed, across eight campuses, and demographically diverse. Nearly three-quarters of students are Hispanic and 16 percent are Black. The college enrolls more than 17,000 immigrant students each year from more than 150 countries. The vast majority of students come from low-income households and are the first in their families to attend college. Against this backdrop, Miami Dade College plays a critical and inspirational role in providing an on-ramp to higher education for students who may otherwise have never found one. It’s why President Eduardo Padrón — himself a Miami Dade graduate — has dubbed Miami Dade “democracy’s college.” But the commitment to students doesn’t end with providing access — rather, the college is acutely focused on ensuring that students graduate or transfer and are successful in whatever comes next in their lives. Miami Dade has fueled my passions, enabled me to be a kind of professional in a way I never thought I could. In pursuit of providing all students an exceptional learning opportunity, the college has transformed the student experience over the past decade by building clear program maps, redesigning academic and nonacademic supports, improving developmental education, and strengthening faculty professional development. Undergirding these reforms have been strategic investments in key organizational capacities, including institutional research and an exemplary center for teaching and learning. One example of Miami Dade’s exceptional efforts to continually improve learning outcomes is in mathematics. In 2011-12, the college embarked on a comprehensive redesign of developmental education in order to dramatically improve the rate at which students enrolled in and passed a college-level math course. The urgency of the work accelerated when a 2013 Florida law made remedial coursework optional for most students. As many more students opted to enroll directly in college-level math regardless of their preparation, the college had to respond quickly. Intermediate Algebra, for example, was redesigned to incorporate more active learning, embedded tutors, proactive interventions when students struggle, and a common syllabus. As a result, pass rates have improved from 53 percent to 62 percent. Each year, the math faculty devise an improvement plan in a specific focus area. The revision to the algebra pathway curriculum has resulted in the development of a common syllabus, assignments, and examinations. It also includes a heavy emphasis on early interventions to ensure students have the right support at the right time. As evidence points to higher success rates for redesigned sections, more full-time faculty are incorporating the redesign strategies in their classes. Isaiah’s experience is not unique at Miami Dade. The college continues to improve its graduation rate, and there are virtually no disparities in outcomes for students of color. Recognizing that some students — particularly those attending part-time — still experience significant barriers to completion, college leaders are developing increasingly sophisticated approaches to better understand how to support students with diverse needs. For example, the college completely redesigned its process for administering financial aid: students now complete one 10-minute application (in addition to the FAFSA) that makes them eligible for more than 300 institutional scholarships. Mathias left a four-year university when his financial aid was revoked because of his immigration status. “A nearly $5,000 bill landed at my feet, and the choice was pretty much made for me,” he said. “I would not be able to pursue a college education … something that I wanted and craved since I was a child.” A friend convinced Mathias to take one class at Miami Dade. A half- hour after Mathias told his professor his personal story, he was introduced to advisors and financial aid officers, who connected him with a scholarship that enabled him to attend full-time.